Mumbai: Indian stocks ended a three-day rally on concern the central bank may extend a record series of increases in borrowing costs to tackle inflation even amid signs growth is slowing. Volkswagen views Suzuki as a separate entity, VW spokesman Michael Brendel said by phone on Sunday. He declined to comment on the Spiegel article. 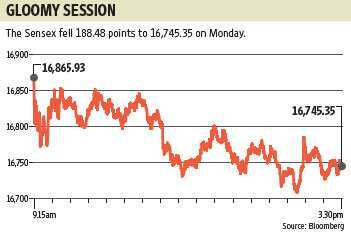 The BSE sensitive index, or Sensex, fell 1.1% to 16,745.35. The measure advanced for a third straight week in the five days ended 16 September, gaining 0.4%. Inflation continues to stay high and is likely to spike up further after last week’s fuel price hike, Prakash Diwan, head of research with Networth Stock Broking Ltd, said in a phone interview on Monday. “We expect another rate hike of 25 to 50 basis points in the RBI’s (Reserve Bank of India) meeting next month." RBI raised its repurchase rate on 16 September for a 12th time since March 2010, a move that contrasts with Brazil and Russia, which cut borrowing costs in the past month, while China has paused rate increases since early July. Indian Oil Corp. Ltd raised the price of gasoline by ₹ 3.14 a litre on 16 September. Output at factories, utilities and mines rose 3.3% in July from a year earlier, following an 8.8% gain in June. India’s benchmark wholesale-price inflation quickened to a 13-month high of 9.78% in August, from 9.22% the previous month, the trade ministry said last week. “With the increase in petrol and interest rates, we could see further cooling off on the growth side," Jitendra Panda, head of broking at Future Capital Holdings Ltd, said by phone. Foreign investors may want to relook and consider what the impact will be on the economy. Overseas investors bought a net ₹ 167 crore of local stocks on 15 September, raising their investment in equities this year to ₹ 1,700 crore, data on the website of the market regulator show. They withdrew a net $2.4 billion in August, the most since October 2008. The Sensex may drop to 12,000 to 15,000 in the near term as emerging market stocks trail US equities in the next six months, Marc Faber, publisher of the Gloom, Boom and Doom report, said in a Bloomberg UTV interview. The S&P CNX Nifty on the National Stock Exchange of India dropped 1% to 5,031.95. The BSE-200 index fell 0.9% to 2,076.93. Sun Pharmaceutical fell 2.6% to ₹ 473.5, the most since 9 August. ICICI Bank Ltd, the biggest private lender, slid 2.8% to ₹ 859.5, ending a three-day rally. ITC Ltd declined 1.3% to ₹ 195.4, a third day of losses. Maruti gained 2.8% to ₹ 1,140.75, the biggest gainer on the Sensex. Suzuki controls 54.2% of India’s biggest car maker, according to Bloomberg data. Tanya Ashreena contributed to this story.